The key to achieving a classic farmhouse look is all about creating an atmosphere of comfort, which starts with a warm, neutral color palette. The foundation should be made up of whites, creams, beiges or even light (but warm) greys, that add depth when layering in some natural wood tones. Floors should also ideally be some kind of wood, preferably salvaged hardwood. Feel free to use colors you're fond of as accent pieces (throw pillows, ottomans, window treatments, etc. ), but in order to stay true to the look try to keep the overall color scheme neutral. When it comes to accessories, look for mixed metals, reclaimed wood, and organic materials such as stone, wicker, rattan, and sisal. Just be sure not to overdo it; while traditional country style relies heavily on accessories, farmhouse keeps them to a minimum. Nothing says farmhouse like a good old-fashioned barn door. Barn doors have become very popular over the last few years, and they're great for several reasons. One is that barn doors can save a ton of floor space. Instead of needing clearance to open a door the way you normally would, it slides along the wall. There still needs to be enough wall space to accommodate it, but it can be a great option for small rooms where every inch of floor space counts. While they are often made of reclaimed wood, barn doors have evolved quite significantly and now people are using all types of materials. If you want a true farmhouse look, stick with the tried and true - barn board and vintage-look hardware. You can also use vintage doors mounted on sliders to create the same look but without using something quite as large as a traditional barn door. If you want a hint of farmhouse style without going all the way, consider something simple but impactful such as a harvest table. Harvest tables work in all kinds of interiors because they're simple and practical. In fact, the definition of harvest table is just a table with four corner legs and skirting - it doesn't get much simpler than that! To give it that farmhouse vibe, look for something made of reclaimed or vintage wood, and look for some turned details in the legs. No matter what style of room you put it in, you'll get a little taste of classic and charming farmhouse style. When it comes to furniture for farmhouse-style rooms, nothing beats big, cozy sofas and chairs, preferably with casual white slipcovers. Since farmhouse style generally takes a no-fuss approach, furniture that is comfortable and easy to wash is ideal. What's particularly great about slipcovers is that not only are they easy to remove and clean, but you can change them with the seasons and give your room a whole new look if you so choose. If you decide to stick with white year round, you can dress them up and down with pillows and throws of different colors and textures. Just remember that the furniture should invite you to sit down, and nothing should look as though it's too delicate to touch. 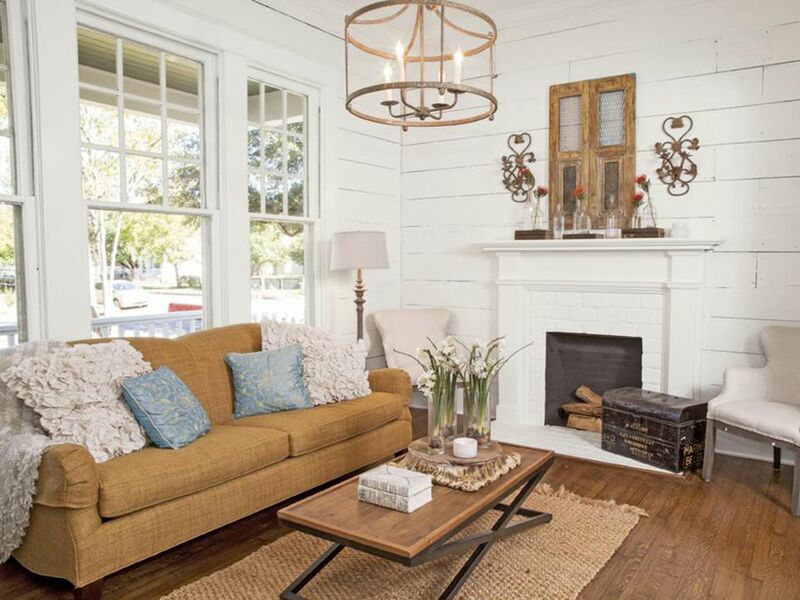 Fixer Upper's Chip and Joanna Gaines may be singlehandedly responsible for the current popularity of farmhouse style and with it, the resurgence of shiplap. While they use it heavily in their interiors, shiplap can also be used subtly to add just a little hint of a farmhouse vibe. This living room mantle doesn't scream farmhouse, but it does whisper it. It gives a relaxed feeling to what could otherwise be a more formal and traditional room. When it comes to shiplap there are plenty of options. You can wrap an entire room in it, try a feature wall, or stick with a small accent as was done in this room. The more you've got, the more intense the look will be. Nothing brings a room into the here and now like technology. So if you want to bring back the nostalgic feeling that farmhouse style evokes, consider hiding as much of your technology as you can. Some ways include hiding cords and routers in decorative boxes with holes cut into the back, or placing large items like televisions and stereos in cupboards and armoires with doors that can be closed. Another, as pictured here, evokes farmhouse style even more by using small sliding barn doors to cover a wall mounted television. The key is to simply hide any evidence of technology as much as possible when the item is not in use. A well-placed piece of antique furniture can be the perfect finishing touch for a farmhouse-style room. Classic armoires are particularly fitting, but feel free to be creative with how you use them. An antique armoire can be used in an entryway for coats and shoes, a kitchen for holding dishes, or a living room for holding electronics. Remember that antiques are right at home in classic farmhouse interiors, but none that are too delicate to touch. Make sure they're sturdy enough to withstand everyday use. While a delicate item here and there is fine, as a general rule, farmhouse style is about substantial items that are able to stand up to a little wear and tear. Farmhouse style is very popular and trendy right now, and because of that, the lines between it and some other similar styles aren't very clear. There are elements of French country, English country, shabby chic, cottage style, and many more. A stone mantel, coach house lanterns, and reclaimed ceiling beams would all fit perfectly into a classic farmhouse. When it comes down to it, it's all about how you use the different elements in order to create the look you want.